I love falsies, they can completely change your look! However, I don't know about you, but I have a hard time choosing a pair of falses eyelashes just by looking at them in the packaging, I need to see them ON someone! So for this review I really wanted to show you the Kiss Ever Ez Lashes on me. I may or may not lost a few lashes, but I think it was worth it! 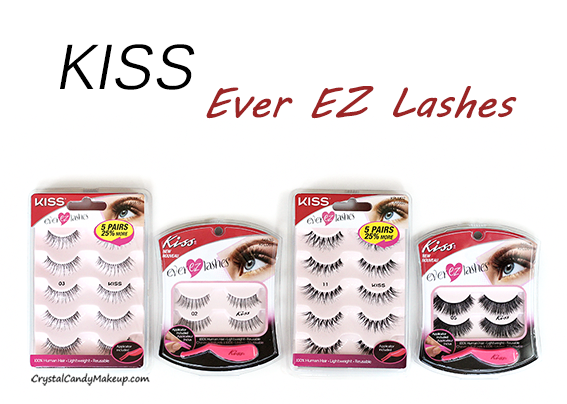 Kiss Ever EZ Lashes are made of 100% natural hair and are quite lightweight. The #05 are a bit heavier but the lash band is still easy to work with for such thick lashes. Please note that the glue isn't included in these kits, which is a good thing for me because I only use Duo glue anyway and I hate seeing all these mini tubes of glue go to waste. You can trim them if needed, but for these photos I didn't do it so you could see how they look. The only model I don't like is the #05, I usually don't like falsies with a blunt and even cut, but I know some of you will love it! These false eyelashes are beautiful yet affordable! The Kiss Ever EZ Lashes retail for $6.47 CDN for 2 pairs, and $12.94 CDN for 5 pairs. Great post, its so helpful to see these on an actual eye. I actually like the #05 style! Thanks for sharing. Oh ce n'est pas facile pour moi non plus mais avec de la pratique et de la patience, je suis certaine que tu peux y arriver!